Have you been told by your doctor you need physiotherapy and ultrasound, but the waiting list is 12 weeks or more? Come privately, the waiting list is hours or days, not weeks or months! I know people who get their doctor's letter, which doesn't even give them an expected date anymore. It says things like; You are on the waiting list and we will call you when your name gets nearer the top of the list. This can take anywhere up to six months, depending on which part of the country you live in. This is why I decided to buy my own ultrasound machine and become trained in its use. So my patients don't have to wait while their condition deteriorates further, they can come virtually straight away. I've been using ultrasound for years. During my 3.5 years working for our local rugby team, I regularly used their in-house machine on injured players to help boost recovery times and reduce time out of the game. This worked remarkably well for the players and I would often have a queue in the changing rooms to hover my magic ultrasound wand over damaged muscles, tendons and ligaments. I have invested in the same ultrasound machine that the football teams use, the rugby teams use, and your healthcare professional uses. This is to focus on optimum functionality and reliability to meet the high demands of elite and amateur sports people alike. But not only that, if you have simply fallen in the garden and damaged your wrist, or you fell and twisted your ankle or knee, or hip. This is to help anyone who needs it, to manage their injuries, to deliver faster rehabilitation and rapid recovery. 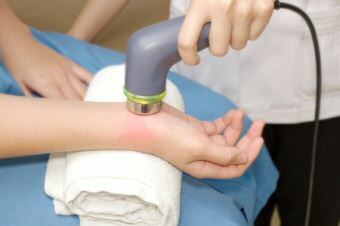 Ultrasound treatment on its own is used to achieve three primary benefits. The first is the speeding up of the healing process from the increase in blood flow in the treated area. The second is the decrease in pain from the reduction of swelling and oedema. The third is the gentle massage of muscles tendons and/or ligaments in the treated area. However, I am first and foremost a hands on therapist. I know that hands on massage, positional release, trigger point release and manual lymphatic drainage work wonders when it comes to healing injuries, old and new. I also know the two compliment each other beautifully. So when it comes to booking your appointment, know that you will have the benefit of both physical therapy and ultrasound therapy together in one package. Maybe you are a bit short of time, and want to get back to work, or just back to life. Waiting for weeks and months for treatment is really putting your life on hold until it's your turn in the queue. This can be quite depressing because you know you are close to a healing, you've been told this is likely to help you, but you're forced to wait like its some kind of punishment. It's not really the fault of your local surgery or the NHS in general, we all know demand is high and resources are rationed. But you can change all that. Book your ultrasound session, with manual therapy backup, using remedial massage techniques to improve range of movement (ROM), trigger point release to help with pain and discomfort, and manual lymphatic drainage to accelerate removal of excess inflammation and oedema. Let's look at this in a little more detail, because my ultrasound is a combination machine which means it is also a Transcutaneous Nerve Stimulation (TENS) machine. What's a 'tens' machine? 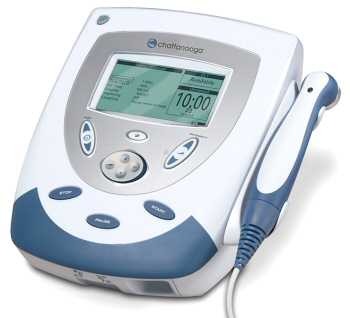 Transcutaneous Nerve Stimulation (TENS) works brilliantly for low back pain, myofascial and arthritic pain, sympathetically mediated pain (nerve pain with tenderness so even light touch hurts), neurogenic pain (pain due to dysfunction of the peripheral or central nervous system), visceral pain (stomach area pain), and postsurgical pain. TENS machines are electrical signal generators that produce a programmable stimulus of electrical current in a variety of strengths, pulse rates and pulse widths. This is perfectly safe and patients rest in a comfortable position while the weak pulses of electricity micro-massage the tissue, helping to stimulate healing of the tissue, settling of the nerve pain signals and increasing blood flow and lymphatic release, much like the ultrasound waves do. Option One - Ultrasound and Manual Therapy. 25mins of ultrasound and 25mins of manual therapy. Option Two - Ultrasound and Transcutaneous Nerve Stimulation (TENS), with therapeutic massage, manipulation and remedial massage or other treatment. Includes full assessment, ultrasound 15-20mins, TENS 15mins, manual treatment 25mins and recovery advice for ongoing treatment at home. 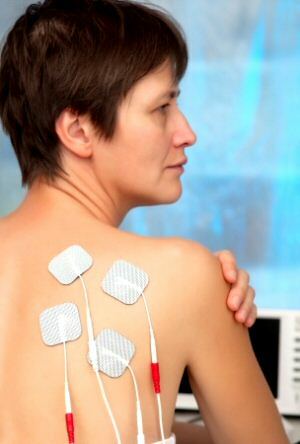 Option Three - Ultrasound and Transcutaneous Nerve Stimulation (TENS) only. This can be very useful in pain control. Includes 30mins of ultrasound and 20mins of TENS, plus aftercare advice. We can decide together the treatment protocols most beneficial for your situation before commencing, thus giving you the best chance of a successful outcome. The truth is, nobody can really tell you. Strange that, isn't it? Nobody can tell you because nobody has bothered to do the research. For something that has been around in one form or another since the invention of electricity, you'd think somebody would have gone to the trouble of finding out. I am gifted with a very logical mind, and can tell you what logic tells me if you're interested. Ultrasound is just that, sound at high frequency, or sound at frequencies greater than 20 kHz (which is the normal upper range of human hearing). It is useful in a multitude of ways in industry and medicine for scanning to diagnose breakage or dysfunction, and even to facilitate repair. But in human terms we are talking about using ultrasound on cells of the human body. Dr.Robert Becker in his book �The Body Electric,� tells us the human body has an electrical frequency and that much about a person�s health can be determined by the frequency of those cells. Healthy cells operate at certain frequencies determined by their location and function within the human body. Further, Dr.Royal Rife found that every diseased cell also has a frequency. Diseased cells are normally lower in frequency to healthy cells of the same type. Substances of higher frequency will destroy diseases of lower frequency. In 1992, Bruce Taino of Taino Technology, determined that the average frequency of a healthy human body during the daytime is 62 to 68 Hz. When the frequency drops, the immune system is compromised. For example, if the frequency drops to 58 Hz, cold and flu symptoms appear; at 55 Hz, diseases like Candida take hold; at 52 Hz, Epstein Bar and at 42 Hz, Cancer. It follows that everything we eat also has an electrical frequency, as does the air we breathe, the pollutants we come into contact with and the water we drink. It makes sense to me that low energy foods and pollutants can cause interference with healthy cells due to differing frequencies. These can contribute toward degenerative diseases and disruption of healthy cells just as quickly and easily as injuring yourself in a fall or some other repetitive strain or injury. Now we introduce ultrasound frequencies into the equation. A damaged cell, or a poisoned cell, or a diseased cell, is low in frequency and therefore low in energy. Recovery of the cell can be slow or damage can be permanent. By bringing it into close proximity of a higher source of energy and frequency, it is possible that the ultrasound vibrations change the frequency of the cell, exciting the cell and bringing it up from a low state to a naturally higher state, thus giving it the ability to heal itself faster and more thoroughly. It's almost like these higher frequencies create an environment in which disease, bacteria, virus, fungus, cancer, etc., CANNOT survive. Is this why, when you are ill and go on a healthy diet, you seem to get better faster, your energy reserves improve and you have greater stamina? Is it the higher frequency of the foods, or is it just luck? Logic tells me that ultrasound works in the same way, bringing us up to a higher vibration, that by itself kick-starts the immune system and the healing process. Does that make as much sense to you as it does me? If it does, why not give it a try? You'll know pretty quickly if this is something you're going to benefit from. Use Ultrasound and/or TENS to create a rapid healing response following injury whenever you're stuck. Please contact me if you want to find out about appointments and prices. I look forward to welcoming you soon. Phil.